A coup d'etat appears to have occurred within the past 4-5 hours. I have just returned from a two hour long tour of the government buildings area where the coup d'etat leaders appear to be based. I carried my camera. There were few foreign journalists in the area and I did not see any television networks on the scene. 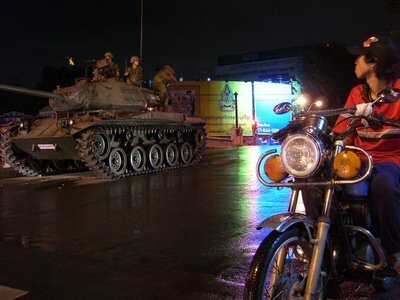 I spoke with the a few tourists, a number of curious Thai onlookers, and some Thais who had turned out to support what appears to be the military overthrow of the "caretaker" government of Thai Prime Minister Thaksin.